Adam Gaudette has racked up seven goals and 14 assists in his last 18 games. 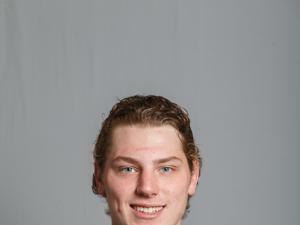 But in a 3-12-3 start for Northeastern, Gaudette also struggled, collecting three goals and two assists through 18 games. But in 18 games since, the 6-foot-1, 183-pound center has piled up seven goals and 14 assists, a major contributor for a NU squad that is on a 15-1-2 run entering this weekend’s Hockey East quarterfinal series at Notre Dame. Gaudette had at least one point in the Huskies’ first seven games after the break, starting with a goal in a 3-3 tie against top-ranked Quinnipiac. He was drafted by the Vancouver Canucks in the fifth round of the 2015 NHL First-Year Player Draft, the 149th overall selection. His younger brothers, Brady and Cam, attend Braintree High and play for the Boston Advantage Hockey Club. Q. The team got off to a slow start. What turned things around? A. We just stuck together as a team and kept doing what coach (Jim Madigan) told us to. We stayed with the game plan and we showed a lot of heart and compassion to dig deep. We’ve been learning from the older guys. If we keep doing the little things and play like we have been since Christmas break, we’ll be fine. Q. Are you surprised by your offensive production? A. I knew I was going to get some playing time coming in, but I try to just do my job and not think about the numbers. If I do that the numbers will come, but numbers are just a reward for hard work and playing the game right. Q. How was your first Beanpot experience? A. It was awesome. Being a local kid I’ve always wanted to play in a Beanpot in front of all those people. I didn’t score in the first game, but I had a goal in the consolation game against Harvard. Q. What is your best attribute on the ice? A. I think my work ethic and playing 200 feet from d-zone to the offensive zone, making smart plays and just doing the little things right. Q. After spending last year in Iowa, how different is it to be in a city like Boston? A. Out in Iowa there was not a lot going on and a lot of flat land. Being back in Boston, there is so much to do and so many places to eat or shop. There is so much history in Boston. It’s awesome to be around the city. Q. Is there a pro player that you try to emulate? A. I’ve always looked up to Patrice Bergeron. We play a very similar game since we are both being centers. We both want to be the guy that coach calls to take a faceoff late in the game or playing 200 feet and just being a responsible player who can produce numbers and help out the team. A. I like to watch Law and Order: Special Victims Unit. It’s probably my favorite show of all time. There are so many episodes that I can watch on Netflix. I really like the crime shows. Q. Best place for a team meal? A. A lot of us like to go to the Cheesecake Factory before the first home game of a weekend series. It’s pretty popular. I like the chicken alfredo. And sometimes coach takes us to Mother Anna’s in the North End for a team dinner. Q. Do you view yourself as a role model for your brothers? A. I feel that they look up to me and I try to help them out as much as possible. I think they both want to come to Northeastern, and I think they are capable of doing that. They just need to continue to work hard, and if I work hard and they follow what I’m doing, they should be fine.